Disabled people are being sold down the river by the Welsh Government, a campaigner has claimed, for scrapping a scheme which pays for home help. Welsh Independent Living Grants (WILGs) pay for cooking, cleaning, dressing and laundry, with a weekly average of £335. Nathan Davies, from Wrexham, who has a progressive nerve disease, fears cash cuts when funding is handed over to local councils in 2018-19. The Welsh Government said the decision was taken on stakeholder advice. The WILG was introduced to help people who previously claimed from the UK government's Independent Living Fund (ILF), which closed in 2015. More than 1,500 people are helped by the scheme. Media captionNathan Davies accuses ministers of "washing their hands of responsibility"
Mr Davies, who suffers from Friedreich's ataxia, received ILF payments for five years and now gets support from the WILG. 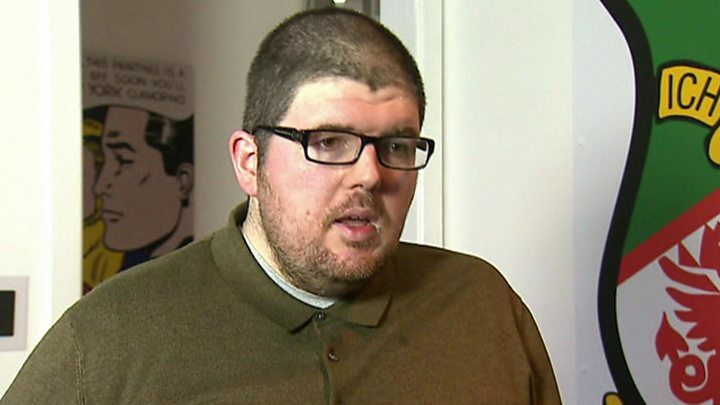 He criticised the Welsh Government's decision, saying: "I feel like they've sold disabled people down the river because they've just washed their hands of all their responsibilities to disabled people in Wales and passed it on to unreliable local authorities. "We don't know what's going to happen at the moment, but if we look at what happened in England then it's not really encouraging, because a lot of disabled people in England have had their out-of-care [funding] cut. "All I can see for the future is yet more fighting and I feel like that Welsh Labour have totally let us down. "I'm just scared, I'm just frightened of what the future holds. "Obviously I'm going to get worse and I'm needing increased support to live independently. "I'm involved in the local community quite a lot at the moment and I want to continue that as much as I can but without adequate support I won't be able to. "I don't want to be solely vegetating in a care home. I wouldn't like that at all. I feel if that happened I would be isolated and secluded and just generally cut off from the rest of society." 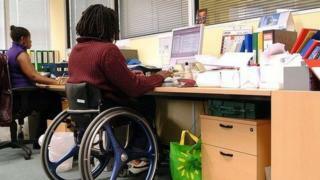 Rhian Davies, chief executive of Disability Wales, said the charity was "disappointed" the Welsh Government did not enhance the existing grant scheme along the lines of the ILF set up by the Scottish Government. She claimed the transition period was short, adding: "Our concern is whether the same level of support will be afforded to people within that two-year time span." The Welsh Government is yet to decide whether local councils will be required to spend the transferred cash on former ILF claimants. Ms Davies called for the funding to be ring-fenced for the next two years. "I think if that assurance was given by the Welsh Government to individuals and their families it would help remove some of the fear that people have that they may lose their ability to live independently in the community," she said. A Welsh Government spokesman said: "The decision to transfer support for former ILF recipients in Wales to local authorities was based on advice from a stakeholder advisory group which included recipient and local government representatives, including Disability Wales. "The introduction of a transitional period of two years in which to agree and put in place future support packages for recipients was a direct result of that group's advice. "For 2017-18 funding will be provided to local authorities via a specific grant as now. No decision has yet been taken as to how funding with be provided to them in 2018-19. "Early discussions are planned with local government representatives for next year around the most effective arrangements beyond 2018-19 to financially support authorities to underpin future arrangements." Welsh Conservative communities spokesman Mark Isherwood called for "firm guarantees" that none of the recipients would be "disadvantaged in any way as a result of this change". "Now more than ever as we enter the winter period people will rightly want a permanent solution to their living needs," he added.